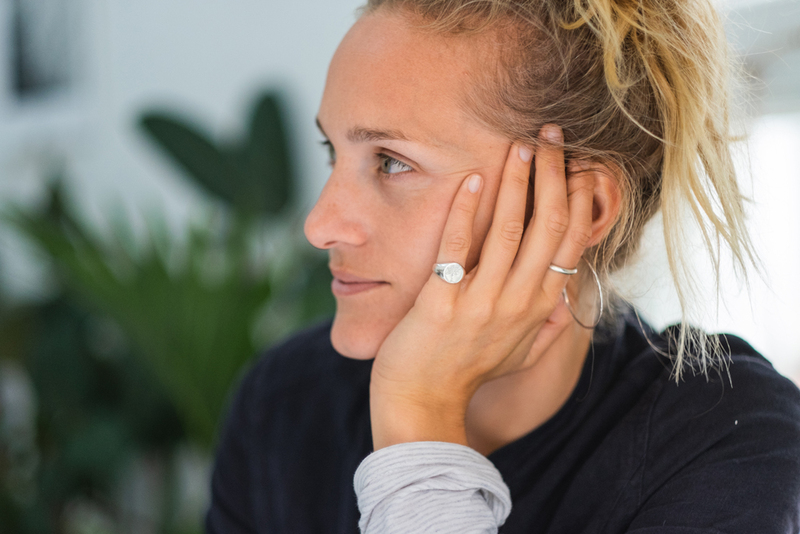 We popped into Falmouth and met the beautiful Tor, owner of Toro Studio, an amazing plant store in Falmouth. Not only does she run this but she also has an incredible skincare line basho. We sat outside the store and had a good old chat to find out more..
Usually, I'll take my dog Foxy into the woods or along the river for a nice long walk before work, or depending on the weather I might jump in the sea for a morning dip. Breakfast is a big deal for me, I love the ritual of making a morning coffee at home, and whipping up something delicious to start the day. What is your favourite piece of Jewellery and what does it mean to you? I've gone through stages of wearing different pieces of jewellery, each piece has represented a specific time in my life whether that has been a hard time or a moment of happiness. I tend to see my jewellery as a kind of armour. 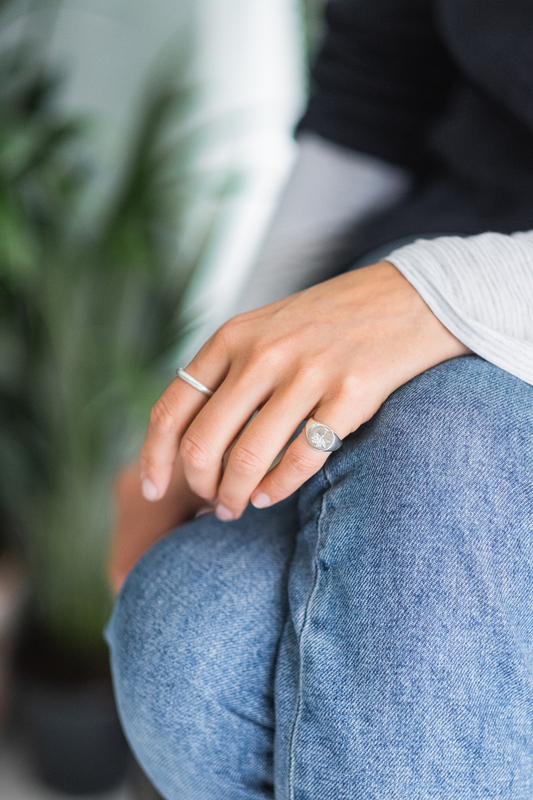 My favourite pieces are two silver bangles that my parents gave me along time ago and they really feel a part of me, the weight and feel of them on my arm. When I had a really short haircut I found that I enjoyed experimenting with big, statement earrings, now a simple pair of hoops is more my thing. Where's the next big adventure? I think the next trip will be a winter adventure to California and then out into desert and canyon country, into the states of Nevada and Utah, road-tripping with my boyfriend. I love being immersed in new landscapes and the way it opens your eyes and mind to something else. Taking time away from normal routines, social media and reconnecting with myself and nature. Tell us a little about basho and Toro and how they came about? Do you make the skincare from home, how did you learn about it? Toro came about after I got back from a Californian adventure 4 years ago and was so inspired by the way house plants were everywhere, from dedicated plant shops, to fundamental parts of interior design in cafes, restaurants, shops and homes. House plants were loved in a way that it felt like we were missing back in the UK. Obviously this has been changing now over the last few years in the big resurgence and renaissance of plants that we've seen and been a part of, but at the time I opened the shop it felt so exciting. Basho was born out of a love of natural, organic skincare and two women coming together to create something simple, beautiful and effective. We are on a wonderful journey together and are constantly learning and growing. We make all of our products by hand in small batches here in Cornwall and have been really overwhelmed by the support and love we've received so far. Big thank you to Tor for enjoying a sunny afternoon and having a chat with us! If you are ever in Falmouth we can highly recommend popping into Toro to see the beautiful space and pick yourself up some amazing plants and skincare. We would also recommend popping next door to eat at the Kitchen its delicious! 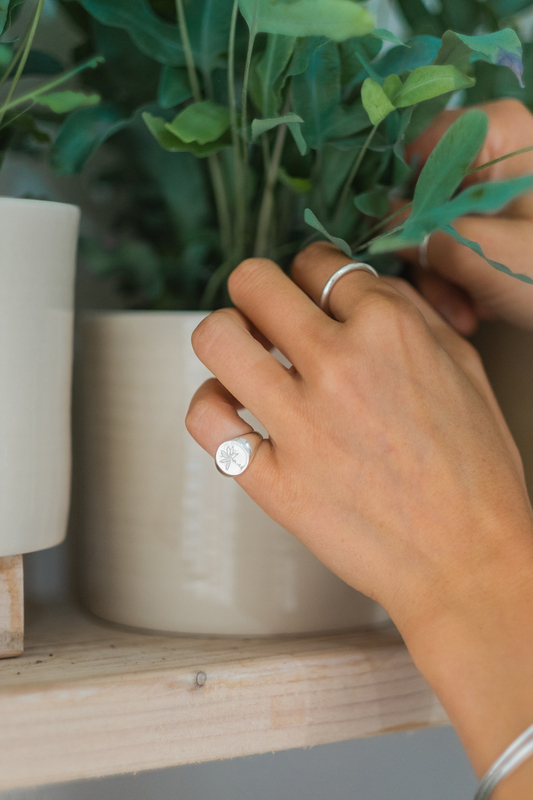 Tor wears the Palm Tree Pendant in Silver and Palm Tree Signet in Silver.